Poor pollinators! 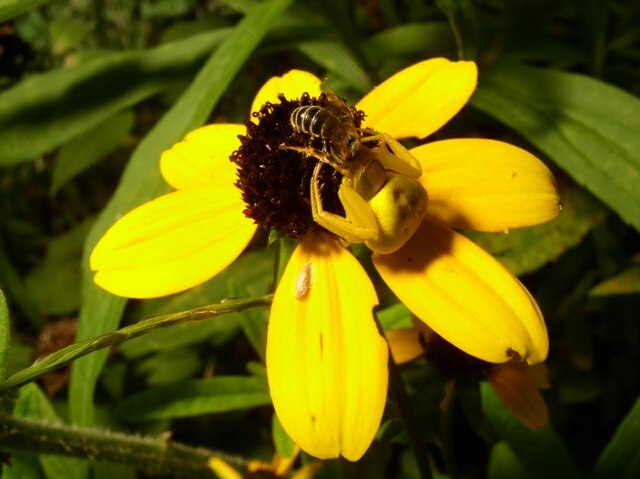 They have to contend with dangerous creatures hiding among the petals of the flowers, not just crab spiders but also sinister ambush bugs. The name is well deserved. These bugs are very good at hiding and waiting patiently until a bee, a fly or some other flower visitor comes near. Then, swift as lightning, they impale their victims with their sharp beaks loaded with fast acting venom. In addition to this form of attack, they have powerful spiny, enlarged front legs that spring into action catching the hapless victim. Just like crab spiders they don’t chew their preys, they drink the fluids and drop the dried up husk down when done feeding. 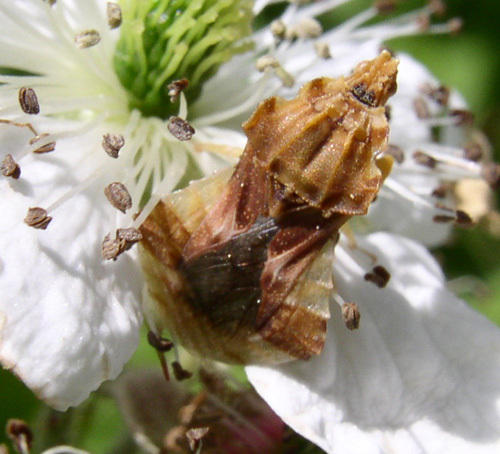 Ambush bugs are usually smaller than many bees and bumble bees, which doesn’t prevent them from catching them. They have a very unusual shape, with protruding, pointy parts. The rear end is wider than the front. The color pattern is broken. All this makes it hard to see their contour and contribute to their camouflage. The males are considerably smaller than the females. Sometimes they ride on a female, when mating and don’t hesitate to take food from them. Habitat. Practically all the habitats visited by all the flower visitors mentioned in this guide. Everywhere where there are flowers. Flowers. A vast array of flowers, usually those grouped in clusters likely to attract many visitors; they like flower heads with many florets that makes it easy for them to hide: goldenrod, asters, queen Anne’s lace, sunflowers. 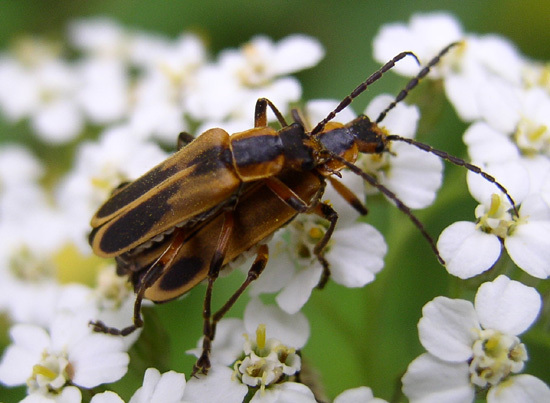 Two very common soldier beetles are the goldenrod soldier beetle and the margined leatherwing. Both are very similar in appearance, orangish or yellow with black markings on the wings. These markings can vary in size markedly in both species. This makes it tricky to tell them apart. 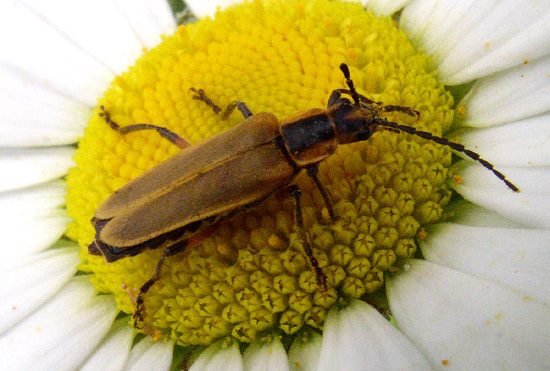 The main differences between the two types of beetles are that the goldenrod beetle has an all black head and the black spot on its pronotum (the section between the head and wings) is square. The margined leatherwing, on the other hand has some orange on the head and the pronotum’s dark patch is like a longitudinal bar. Finally, one good difference is the time of the year in which they are active. 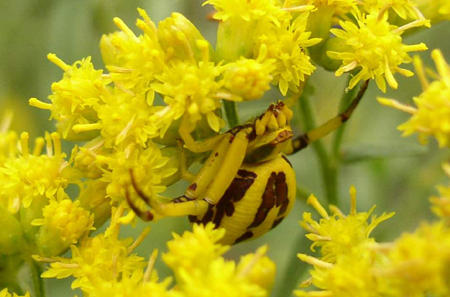 You find the goldenrod beetle in late summer and in the fall and it mostly visits goldenrod flowers. The margined leatherwing is active earlier in the season, so it is not likely to be seen on goldenrod, which hasn’t started blooming. Flowers. Margined leatherwing, asters, queen Anne’s lace, milkweeds. 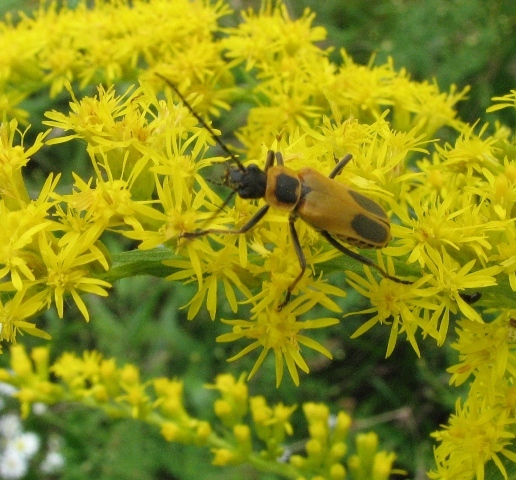 Goldenrod soldier beetle, primarily goldenrod and other fall flowers. Not all flower visitors are insects and not all are pollinators. In fact, some are a threat to pollinators. 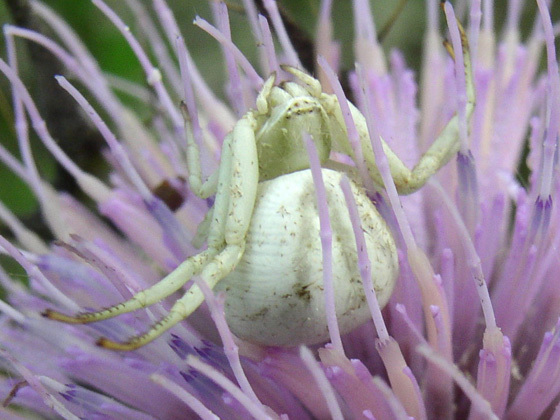 Such is the case of spiders, crab spiders in particular. The name is very appropriate: they look and they move like crabs. They are very adept at hiding between petals and waiting patiently for prey to fall right in their clutches. They are not very discriminating; any flower visitor will do. 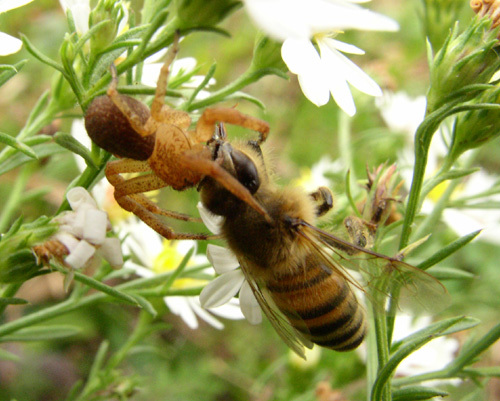 Bees of many kinds, as well as flies and butterflies and even beetles fall prey to them. They are capable of overpowering creatures bigger than themselves. With their fangs they inject saliva, rich in enzymes that act the way a strong acid would, dissolving the tissues of the victim. Spiders can’t chew solids, so they take this “soup” instead. 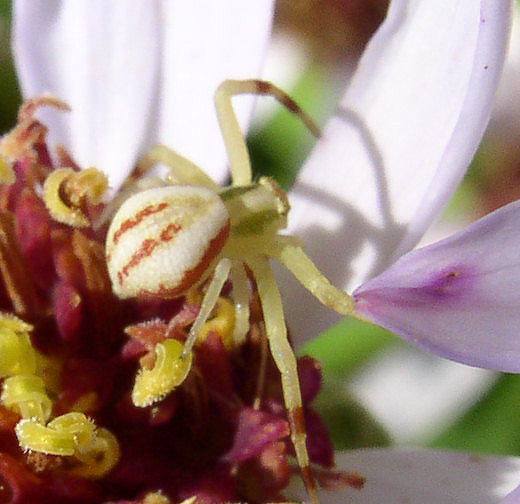 Female crab spiders come in different colors. Usually they match well the color of the flower where they are hiding. It is said that they can change coloration if they move to another flower of a different color and that this change takes several days. Males are a lot smaller and have thinner abdomens. They are not seen very often. Season. From April to October. Practically year round in southern states. Flowers. they prefer flat open flowers, especially in the Asteraceae family. Asters, thistles, sunflowers, goldenrods provide just the right kind of hiding places. Skippers look like a cross between a butterfly and a moth. They are usually rather drab and brown, although some can be colorful. The main difference between skippers and butterflies is in the antennae, they are similar to those of butterflies, except that the little thickening at the end of it is shaped like a hook rather than a knob. They fly skipping about and that is how they get their name. 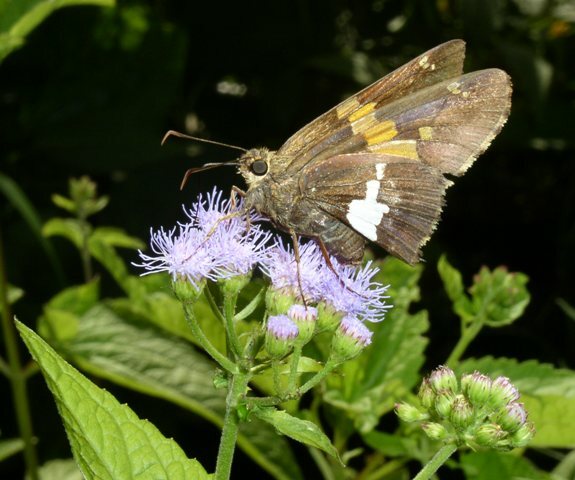 The silver-spotted skipper is one likely to catch your attention. 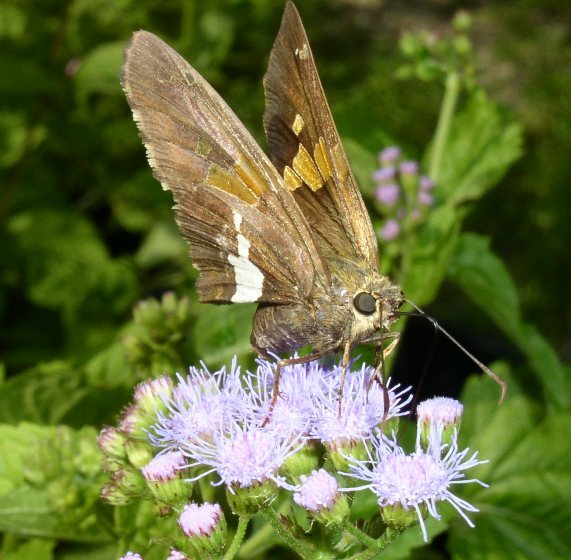 It is larger than most skippers, chocolate brown with a distinctive white or silvery spot on the underside of its back wings. 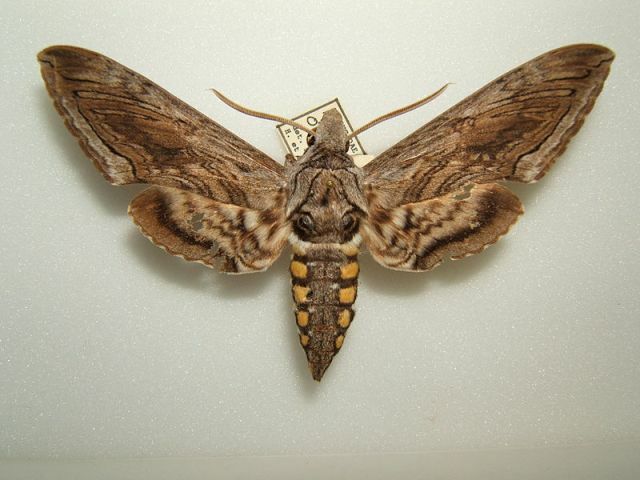 It also has an irregular golden band on the front wings visible both on the dorsal and ventral sides. Like butterflies and moths it has a long tongue shaped like a drinking straw which it carries rolled up under its chin. It uses it to get nectar from deep throated flowers, although it never passes an opportunity to nectar at flat, open flowers when it has a chance. Season. Seen from March to November and even December in some states, but mostly through the summer months. 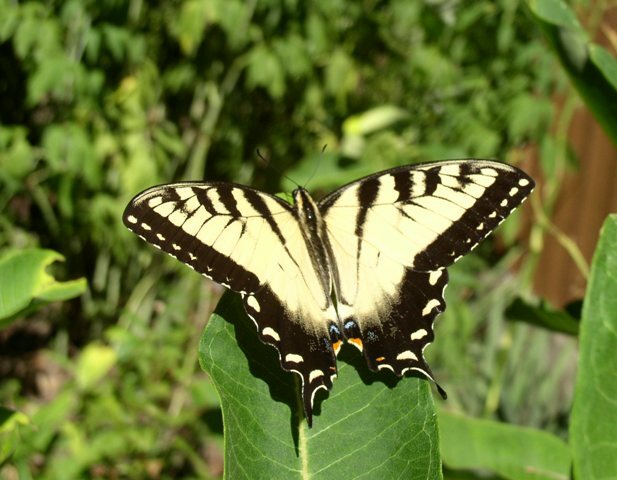 The tiger swallowtail is a very impressive creature with its large size, bright colors and bold pattern. 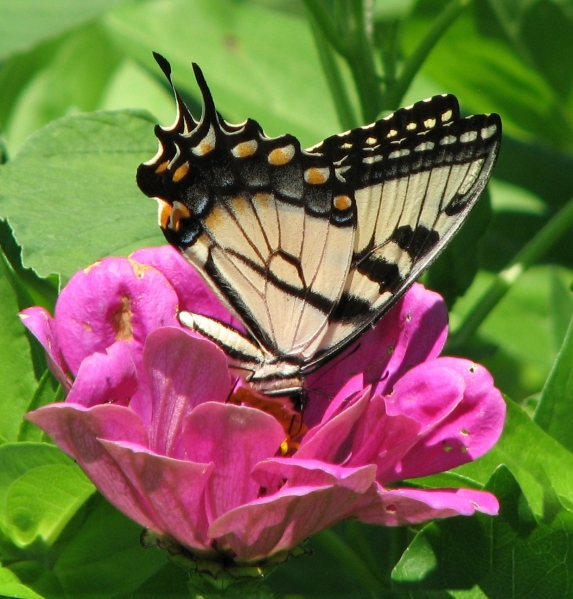 It belongs to a group of butterflies called swallowtails in reference to the two projections, “tails” of their hind wings. It is thought that these projections may confuse predators making them think that the tails are actually antennae. When a bird goes for the head it may get a piece of wing instead, allowing the butterfly to escape without suffering a lethal injury. The name refers to its yellow and black stripes, reminiscent of a tiger’s stripes. One peculiarity of this species of butterflies is that some females instead of being yellow with black stripes are bluish black with white spots. 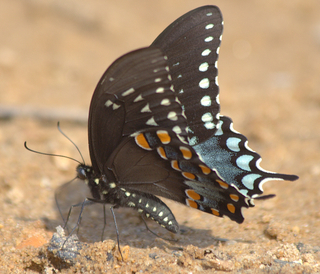 These females look very much like another fairly common butterfly, the spicebush swallowtail. The former lacks the orange spots of the latter on the underside of the wings; this makes it possible to tell them apart. 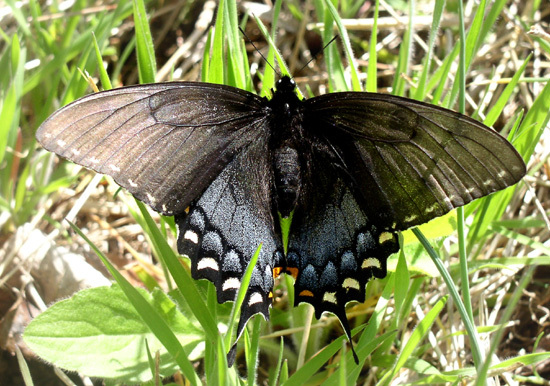 Spicebush swallowtails taste bad to predators. 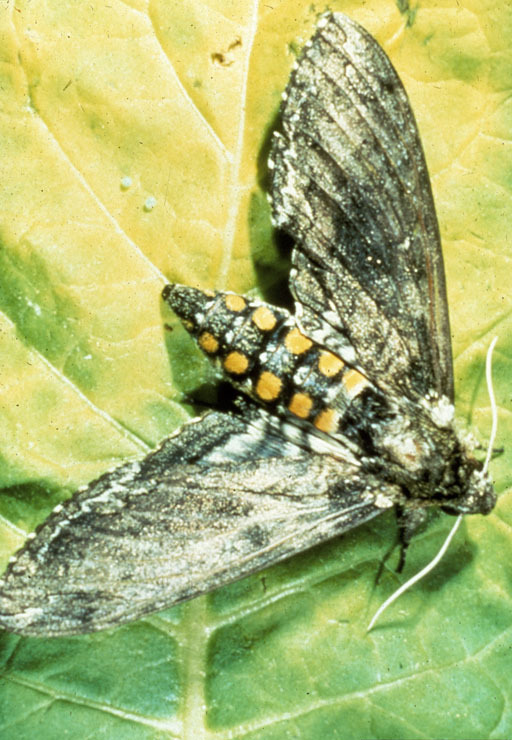 It is possible that dark female tiger swallowtails masquerade as members of the other species to lead predators to believe that they are bad tasting too. The most beloved and best known butterfly in North America is, without doubt, the monarch butterfly. 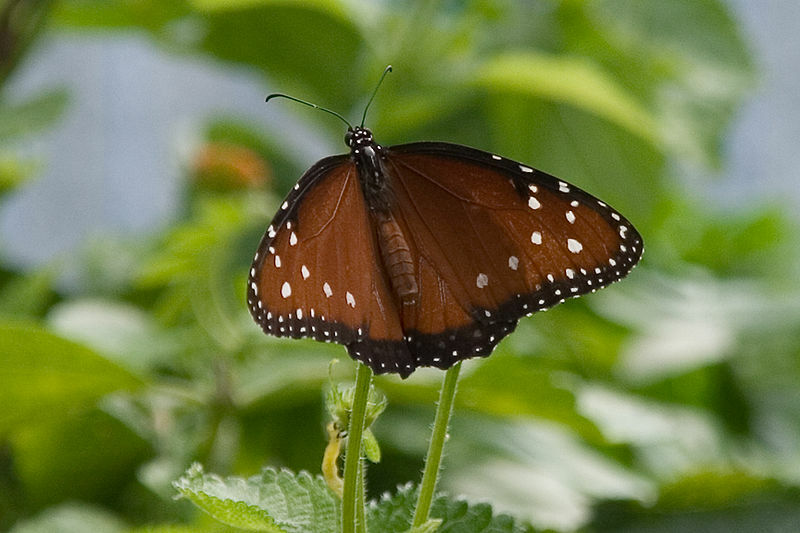 However, people often mistake other orange and black butterflies, such as viceroys and queens, for monarchs. 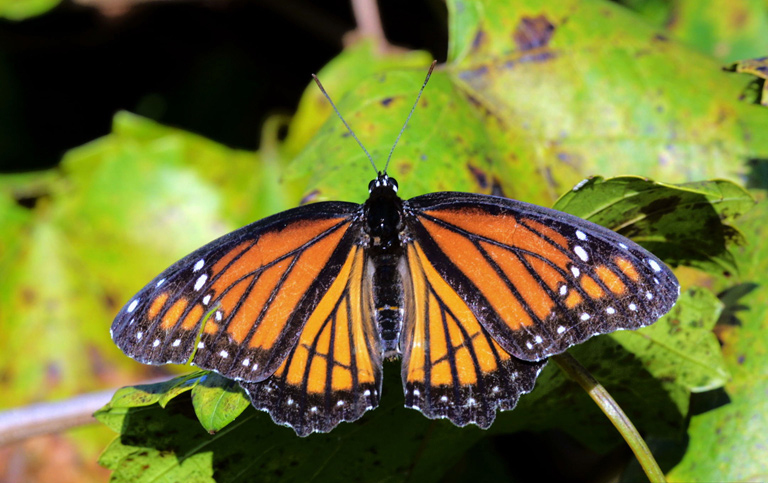 Queens are related to monarchs; their pattern is similar but with fewer lines and a darker color. Viceroys are not related but they look remarkably similar at first sight, probably because they want to fool predators into thinking that they taste just as bad as monarchs. Look for a line that runs across the hind wing of a viceroy, this line is absent in monarchs. Viceroys are a little smaller than monarchs. 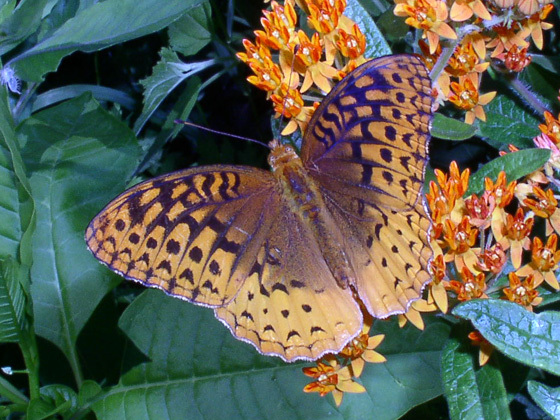 Fritillaries are also smaller than monarchs and their pattern doesn’t include white dots. The monarch’s life cycle is remarkable. It migrates in the fall all the way to Mexico, where it spends the winter. It starts migrating back north in early spring, where it reproduces and has several new generations; each keeps migrating farther and farther north through the spring and summer all the way to northern United States and Canada. The monarchs that live in the western part of the United States only migrate as far south as California where they spend the winter. 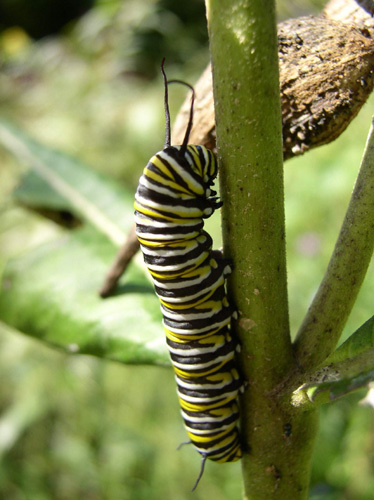 The caterpillars are brightly striped black, yellow and white. 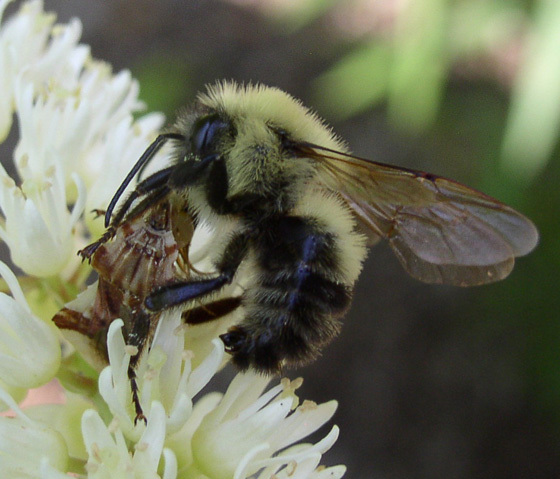 They feed on milkweeds (several different species) so that is where you also find the adults often; adults take nectar from a variety of flowers, not just milkweeds, and can be seen visiting them. Season. In California they are found year round. In southern states such as Texas and Florida they can be seen from February to as late as November. The farther north you go the shorter the season for monarchs. In northern states they are found from June to October. Flowers. 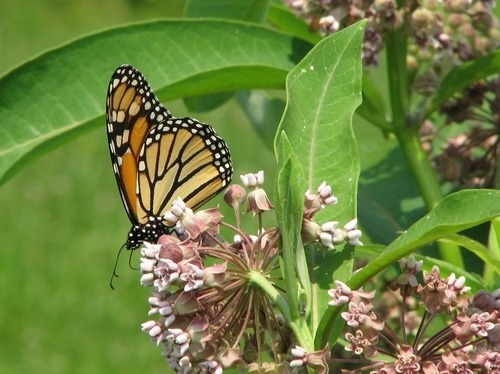 Seen quite often at milkweeds, common, swamp and several other milkweed species. Also found at many other flowers depending on the season: asters, goldenrods, bee balm. Some flies look more like house flies than the previous two, syrphid and bee flies. So they are more familiar to us. Some of them visit flowers and do pollination, so they are valuable in their own right. These are blowflies; one of them is about the same size as a house fly or slightly larger. Its color is metallic green, but sometimes it may look coppery or bluish. 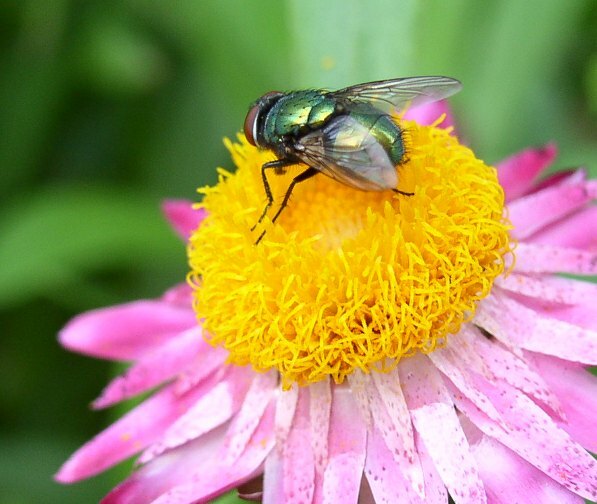 The color has earned them the common name of green bottle flies or blue bottle flies. The eyes are big and generally bright red. It is found throughout North America; in fact it is found practically all around the world. It can be found just about any season, especially in southern states. 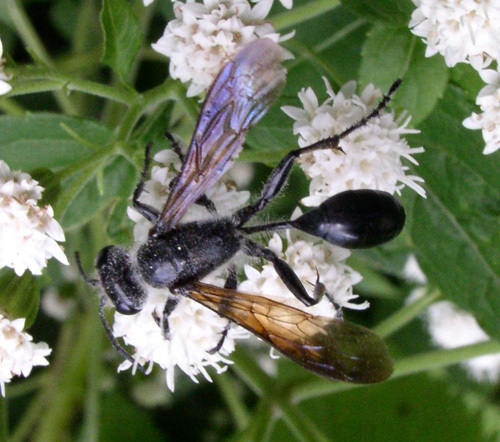 It is used as a pollinator of some crops such as onions and cabbage. In addition to visiting flowers of the mentioned types they are also found at rotten meat, such as road kills. That is where they lay their eggs, which feed on the carrion. For this reason they are used in forensic studies to determine time of death. Habitat. Almost any habitat is good for them. They may frequent meat and partially rotten fruit. Season. Most common between March and October but also during the winter in warmer climates. Flowers. They visit many kinds of flowers, especially related to onions and cabbage. They are also found at rotten meat, such as road kills. 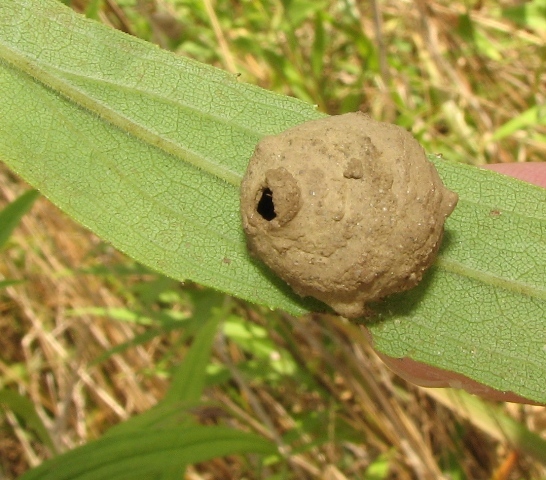 Some little wasps build nests that look exactly like clay pots, so, naturally, they are called potter wasps. You may find one of these interesting clay pots glued to the underside of a leaf or to a stem. 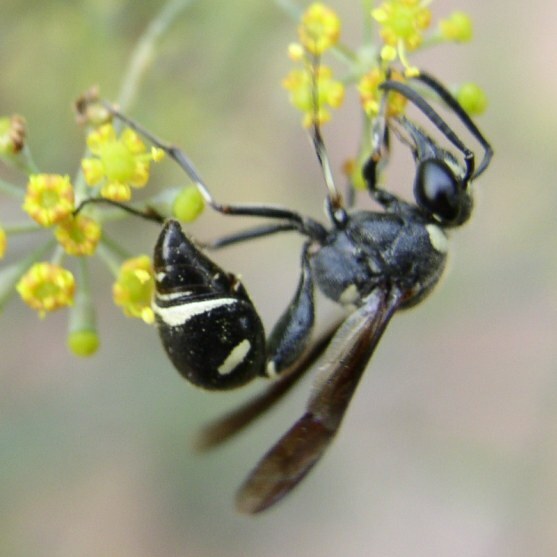 Both types of wasps are mostly black with a striking pattern of white or yellow stripes. They measure from ½” to ¾”. 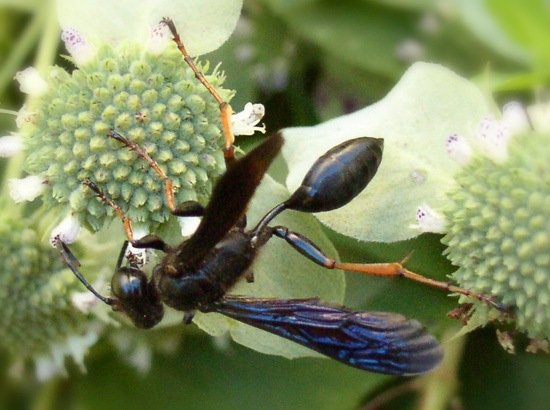 The abdomen of potter wasps has a second narrowing behind the “wasp waist” giving them a distinctive look. The abdomen of mason wasps is not like that of potter wasps. At most it has a slight narrowing and it is more robust. Season. From March to December, but mostly they are seen between July and October. Flowers. A wide variety of flowers, mostly in the aster family; very numerous on goldenrods. Also in some Apiaceae, such as queen Anne’s lace. Grass carrying wasps get their name from their habit to carry long pieces of grass which they use in their nests. If you see a flying stem or blade of grass, look again and you will notice the wasp that is carrying it. They are black, slender and with an incredibly long and thin waist. That is why their other common name is thread-waisted wasps. Their wings have a smoky or violet color. They can be as large as ¾”. They make their nests inside hollow tubes, such as twigs or holes in wood. Sometimes they use the tracks of window screens or window frames which they stuff with grass before placing some prey and an egg. There may be a row of similarly prepared cells. 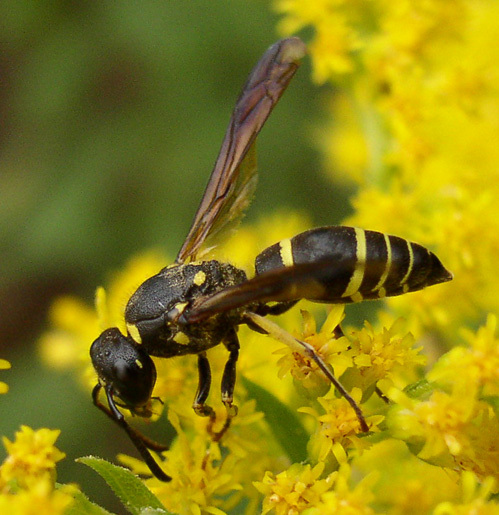 There is nothing to be alarmed; these wasps pose no threat to humans and don’t damage your house. They catch katydids or crickets to feed their young, so they are good pest controls. Habitat. Fields, open areas, grassy areas. Season. From March to December in most of North America. Most common in July and August. You are currently browsing the Polinizador's Blog blog archives for April, 2011.